Originally published in modified form as "Tectonic evolution of northeast Syria: Regional implications and hydrocarbon prospects", by G. Brew, R. Litak, M. Barazangi and T. Sawaf, GeoArabia, 4, 389-318, 1999. All rights reserved. We present the Phanerozoic tectonic evolution of northeast Syria and incorporate the results into regional deformation models of the northern Arabian platform and nearby Arabian plate boundaries. Based on analysis of extensive seismic reflection profiles and well data, we interpret that the Sinjar - Abd el Aziz area in northeast Syria was subsiding under extension at various rates from the Carboniferous until the end of the Mesozoic, most markedly during the latest Cretaceous. The predominant basin through most of the Late Paleozoic and Mesozoic was SW-NE trending; this formed the northeast extension of the major Palmyride basin to the southwest. During the Late Cretaceous, extension in eastern Syria initiated along SE-NW and then E-W trends - possibly as a result of changing subduction geometries and plate motions in the NeoTethys to the northeast. The E-W striking faulting resulted in syntectonic deposition of up to ~1600 m of Late Campanian - Maastrichtian marly limestone in the Sinjar - Abd el Aziz area. The area was subjected to horizontal shortening throughout the Cenozoic, primarily during Plio-Pleistocene time, resulting in structural inversion along some of the faults. Although crustal shortening through the Syrian Sinjar and Abd el Aziz structures is relatively minor (~1%), this has been critical to hydrocarbon trap formation in Mesozoic and Cenozoic strata through the formation of fault-propagation folds. We present regional models that show the interrelated tectonic history of northeast Syria, the Palmyrides, and the Euphrates fault system are all inseparably linked to the polyphase opening and closing of the nearby NeoTethys Ocean. Syria, and the surrounding northern Arabian platform, offer an exemplary environment in which to study intraplate tectonic deformation. It has been established that tectonic deformation within Syria (e.g. Barazangi et al., 1993) has been controlled by repeated collisions, openings, and movements on the plate boundaries that almost completely surrounded the country (Figure 3.1, inset). Previous workers have studied certain elements of northern Arabian tectonics in great detail, including the Palmyride fold and thrust belt in central Syria (e.g. Chaimov et al., 1990; Best et al., 1993), and the Euphrates graben in eastern Syria (Litak et al., 1997; 1998). Until recently northeast Syria remained relatively unstudied. Interpretation of the geologic history of that area can help to further develop tectonic models of the region. Northeast Syria is the site of significant oil accumulations, and the focus of continuing exploration activity. The most comprehensive account of northeast Syria was by Metwalli et al. (1974) who examined the stratigraphic and depositional development of that area together with northwestern Iraq. The geology of northeast Syria was also discussed in a minor way by Ponikarov (1966); Ala and Moss (1979); Lovelock (1984); Leonov et al. (1986); Sawaf et al. (1993) and Laws and Wilson (1997), without exclusive focus on that area. An important contribution by Kent and Hickman (1997) was based upon petroleum exploration of the Abd el Aziz anticlinorium (Figure 3.1). Their work was a very thorough account of the evolution of that structure since the Late Mesozoic, and was the first detailed subsurface investigation within northeast Syria to be published. We present a spatially and temporally more expansive study, based on more extensive data, than any previously published work on this area. Our findings are set into a regional tectonic context by incorporating results from this, and similar studies of Syria, into a model of northern Arabian plate deformation since the Late Paleozoic. We find that previous suggestions of an aulacogen in central Syria (e.g. Best et al., 1993) can explain the Late Paleozoic and Early Mesozoic evolution of these features, but more enigmatic causes are involved in the Late Cretaceous rifting in eastern Syria. The entire area has been subjected to compression in the Neogene. The implications of these findings for hydrocarbon exploration are considered. The data used in this study were primarily around 3300 km of 2-D seismic reflection profiles and information from over 60 wells (Figure 3.2). These data were provided by the Syrian Petroleum Company (SPC) and are part of a much larger database held at Cornell University as part of ongoing joint collaborative research between SPC and Cornell. Limited data from Iraq were obtained from the literature including Al-Naqib (1960) and Al-Jumaily and Domaci (1976). Seismic data were mainly migrated 4.0 seconds TWT hardcopy records, collected using Vibroseis sources during the 1970's, 80's and early 90's. Formation top data were available for all wells, with wire-line logs available for around a quarter of the holes. The available sonic logs (Figure 3.2) were digitized to produce synthetic seismograms that were tied to the seismic data. Seismic refraction data (Brew et al., 1997) provided some information on the deeper sedimentary and basement structure. In addition, 1:200,000 scale geologic maps and reports (Ponikarov, 1966), gravity field data (BEICIP, 1975), high resolution topography (e.g. Figure 3.1) and Landsat TM imagery (see Kent and Hickman, 1997) were available for the whole study area. We interpreted the seismic reflection profiles and tied them to coincident or nearby wells for stratigraphic identification. Where possible, synthetic seismograms were used for the ties, alternatively time-depth charts constructed from sonic logs facilitated the ties. Several reflectors, chosen for their prominence, continuity, and geological significance, were mapped over the study area (shown as bold interfaces in Figure 3.3). At each stage in the interpretation all the available information was integrated to ensure the interpretation agreed with all the data sources. Northeast Syria and northwest Iraq are dominated by two topographic and structural highs (Figure 3.1). These are the Sinjar uplift (length ~150 km, max. elevation 1463 m) and Jebel Abd el Aziz (length ~100 km, max. elevation 920 m), separated by the Khabour river. We refer to this combined region as the 'Sinjar - Abd el Aziz area'. These highs are the result of Pliocene - Recent structural reactivation of normal faults forming fault-propagation folds and some associated break-through faults. This reactivation has structurally inverted many older structures. The original normal faults were roughly east - west striking and were active almost exclusively in the latest Cretaceous (latest Campanian - Maastrichtian), extending from the west through Jebel Abd el Aziz and eastwards well into Iraq (Figure 3.1). Prior to this episode of normal faulting, the area was host to a northeast trending basin, associated with the Palmyride rift and subsequent subsidence, that extended across Syria since Carboniferous time. A subsidence reconstruction of the westernmost Sinjar area based on well data (Tichreen 2, location on Figure 3.2) is shown in Figure 3.7. Present-day formation thicknesses are projected back in time by estimating compaction rates, densities and porosity values for the sediments following the method of Sclater and Christie (1980). Formation thicknesses for the Paleozoic section are projected from nearby wells. There is uncertainty of erosion rates at the unconformities, thus this curve represents the minimum subsidence amount. We see three episodes of significant sedimentation; in the Carboniferous, in the Permian, followed by continued subsidence in the Early Mesozoic, and in the latest Cretaceous. Sawaf et al. (1999) and Stampfli et al. (1999) had similar findings. Based upon our integrated interpretations, Figure 3.8, and certain complexities not illustrated by this schematic model, are now chronologically discussed. Since no well penetrates the metamorphic basement in Syria, depth to basement estimates of around 6 km come from a detailed refraction data analysis (Brew et al., 1997). Cambrian sediments are also not penetrated within the study area, but Ordovician clastics are found over the entire region (Figure 3.9) and form a sequence many kilometers thick (Sawaf et al., 1993). Lower Silurian shales were deposited throughout the region by repeated regressions and transgressions (Beydoun, 1991). However, Upper Silurian and Devonian formations are entirely absent. The top of the Silurian unconformity, where observed, shows little structure, perhaps suggesting a regional Silurian / Devonian uplift. Carboniferous time, coincident with eustatic transgression, appears to have marked the beginnings of a northeast - southwest trending trough running through Syria roughly along the axis of the present-day Palmyride fold and thrust belt, with continuation to the northeast (e.g. Best et al., 1993). Figure 3.10 shows some fault-related stratigraphic thickening of Carboniferous strata on the northwestern margin of the clastic basin, and some subtle onlap of the Carboniferous towards the north. Abrupt thickness changes of Carboniferous strata in adjacent wells elsewhere in the Sinjar area point to some fault-related thickening. Subsidence analysis (Figure 3.7) based on well sections also indicates a Carboniferous event, and isopachs show that much of the thickening appears to be a consequence of broad subsidence, rather than being purely fault controlled. The lack of Late Carboniferous and Early Permian age deposits in the region suggests emergence at that time, although this could be due to Early Triassic erosion. Subsidence analysis (Figure 3.7) and isopachs suggest rifting and subsidence in the Late Permian that propagated along the line of the Carboniferous subsidence event. At the Permo-Triassic boundary the region underwent broad uplift and was again exposed and eroded. Thus only the deepest parts of the Palmyride / Sinjar rift preserved the Late Permian Amanous sandstone formation, as it was eroded out or not deposited to the north and south. Carboniferous and Lower Silurian formations were also eroded out to the north on the Mardin high during this episode (Figures 3.8 and 3.11). This led to a Paleozoic subcrop distribution where the oldest formations the most extensive, and younger ones are progressively limited by widespread Permo-Triassic erosion (Figure 3.9). Whilst we report only limited Paleozoic faulting in this area, evidence for such activity is somewhat obscured by poorer quality seismic data and more recent tectonic events. Even so, isopach data suggest that most of the Paleozoic stratigraphic thickening in the Sinjar area was subsidence related. The Derro high (Figures 3.1 and 3.9) was an uplift between the Palmyride / Sinjar basins during much of their formation. Well data indicate that either the Derro high was an uplift during Permo - Carboniferous time, or was subjected to later uplift and extensive Permo-Triassic erosion; seismic data does not permit the resolution of this issue. The very limited subcrops of the Lower Triassic Amanous shale (Muloussa A) formation encountered in the southwest of the study area are indicative of continued Permo-Triassic emergence and only gradual transgression from the Palmyride area towards the northeast. The situation changed substantially in the Middle Triassic when deposition was again widespread. The Middle Triassic Kurrachine Dolomite (Muloussa B) formation (Figure 3.3) is preserved in subcrop everywhere in the study area, except in the Turkish borderlands where it was lost to later erosion. During the Early Mesozoic, the Palmyride / Sinjar basins accumulated great thicknesses of Triassic shallow marine carbonates. The thickening in the Sinjar basin at this time was predominately accommodated through broad downwarping, as illustrated by onlapping relationship of Triassic strata onto Paleozoic formations (e.g. Figure 3.11). This pattern persisted throughout the Mesozoic until Coniacian times (Figure 3.7). Some evidence for Early Mesozoic fault related thickening is shown in Figures 3.12 and 3.13. 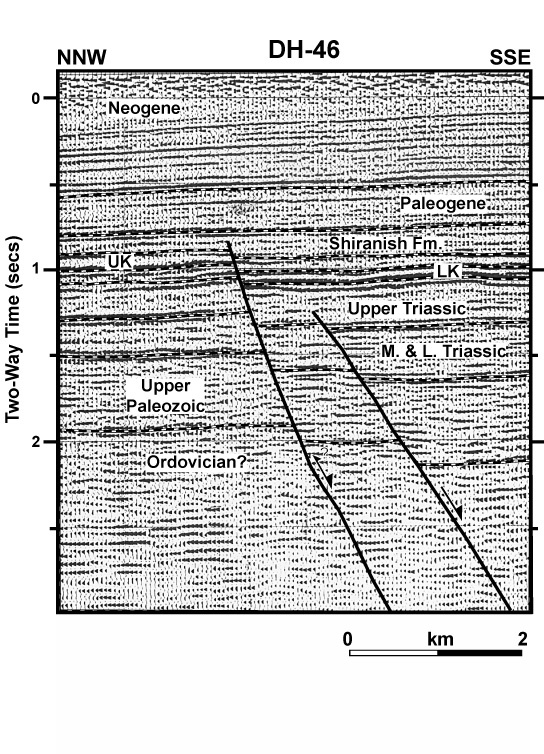 These figures show northeast - southwest striking faults that accommodated some movement in the Triassic, and in some cases have been active until at least Neogene time (Figure 3.13). Further examples of this orientation of faults are found (Figure 3.14). Note that Figure 3.13 also shows possible thickening of the Permian and Carboniferous strata across some of these northeast - southwest trending faults, indicating that these faults may also have been active in the Late Paleozoic rifting event. The broad downwarping and deposition continued into the Jurassic and ended with a major uplift event during the Late Jurassic that continued into the Early Cretaceous. With widespread erosion of much of the Jurassic and Triassic section at this time, Jurassic sediments are only preserved in the deepest parts of the Sinjar and Palmyride areas. Sawaf et al. (1993) described the Neocomian age deltaic sandstone and conglomerates of the reservoir-quality Rutba formation (Figure 3.3) that were deposited in eastern Syria during this regression. Transgression during Aptian - Albian time allowed deposition to resume in the Sinjar basin, with perhaps even less fault-related stratigraphic thickening than the Early Mesozoic (e.g. Figure 3.13). Beginning in Coniacian times, there was a major change from northwest - southeast extension to a southwest - northeast extensional regime. This is manifest in the opening of the Euphrates fault system with associated faulting striking northwestwards to the west of the Abd el Aziz area (Figure 3.14) (Kent and Hickman, 1997; Litak et al., 1997). From well data it is clear that thickening of the mid-Senonian Soukhne formation took place to the southwest across the Abba fault (Figure 3.14) - part of the Euphrates faulting event. The northeast - southwest striking faults mentioned previously (Figure 3.13) are seen to be older than the Euphrates faulting and, as mentioned, may have their origin in the Paleozoic rifting and trough formation in central Syria. These older faults partially control the Maastrichtian sedimentation in the Euphrates fault system (Alsdorf et al., 1995). Also, the strike direction of faults in the Euphrates system reorient at this point (Figure 3.14), and no northwest - southeast trending Euphrates-type faults that cross the older northeast - southwest faults are found (Figure 3.14). The Late Campanian was a time of further change when a new set of roughly east-west striking faults developed in the Sinjar - Abd el Aziz area (Figure 3.14). It is most likely that these were transtensional structures, and antithetic faults on some of these major latest Cretaceous faults attest to this (Figures 3.4, 3.10, and 3.13). The amount of strike-slip was likely relatively small, although very difficult to quantify given the current data. The overwhelming development at this stage was normal movement on the east - west faults focusing the deposition of the Shiranish formation (Figure 3.4). Similar structures extend eastwards into Iraq (e.g. Hart and Hay, 1974), eventually curving more northwest - southeast before merging with the more prominent Zagros trend. The timing of the faulting is consistent throughout the trend with thickening constrained to Late Campanian - Maastrichtian time. No fault-related thickening found either immediately above or below this interval. The Shiranish formation was a high fluid content body that would easily have flowed to fill the space created by the normal faulting (Hart and Hay, 1974). Paleocurrent studies by Kent and Hickman (1997) on sand bodies within the Shiranish show that currents were mainly from the north and northeast, that is, from the Mardin high. To the west, the Abd el Aziz faulting appears to have been bounded by the previously mentioned Abba fault (Figure 3.14). Well data indicate that Shiranish thickness is approximately 200 meters greater on the Abd el Aziz (northeast) side of this fault, thus the Abba fault shows signs of motion both down to southwest and subsequently down to the northeast. During the latest Cretaceous extensional phase, the earlier northeast - southwest striking faults most likely underwent transtension and acted as transfer faults between the east - west striking faults (Chaimov et al. (1993) documented a similar set of faults active during the Mesozoic in the southwest Palmyrides. Figures 3.12 and 3.13 show some thickening of the Shiranish formation across these faults. Given the more recent stages of movement on these structures, the amount of strike-slip that they underwent is difficult to quantify, although the minor deformation caused by these faults as a whole would suggest it was limited. The latest Cretaceous normal faulting that we document here appears to have been a thick-skinned phenomenon. No detachment is apparent on any of the seismic lines examined from the area. Although the quality of the seismic data degrades with time, and most sections are only 4 seconds TWT, many of the faults appear to be slightly listric with depth. We speculate that these faults are detaching at some deeper level in the crust. The limited spatial and temporal extent of the latest Cretaceous faulting suggest that perhaps the whole crust was not involved in this event. Thus we do not consider this structure to be a 'rift' in the true sense, and avoid the use of that term here (e.g. Sengor, 1995). This observation is supported by the lack of extensive pre-rifting erosion, and the absence of a Cenozoic thermal sag basin above the Sinjar area (Figure 3.15), such as the sag clearly evident above the Euphrates graben (Litak et al., 1998). Estimates of extension, through line-length balancing, have been made assuming that all of the extension took place within a 34 km zone (Figure 3.4), and that the strike-slip activity had negligible effect. Only the latest Cretaceous extensional event was considered. The balancing yields an extensional estimate of around 3.5 % (1.2 km); the value is probably greater for the Iraqi portion of the Sinjar structure. Crustal-scale models based on the thickness of the syn-rift sedimentation and the assumption of isostatic equilibrium yield a much greater value of stretching. This discrepancy could be because the extension was of such limited spatial and temporal extent that isostasy was not maintained, and perhaps the whole crust was not involved in the latest Cretaceous extensional event. Although there are hints of minor pulses of contractional tectonics during the Eocene and Miocene (Kent and Hickman, 1997), most horizontal shortening of the Sinjar - Abd el Aziz area did not take place until the Late Pliocene. This timing has been established using stratigraphic relationships by workers in the field (Ponikarov, 1966; Kent and Hickman, 1997), and is supported by the examples we have presented. Figure 3.4 shows uniform stratigraphic thickness throughout the Miocene section, with no signs of onlap. Some of the poorly reflective Pliocene section also records no tectonism, suggesting that the shortening event began here probably no earlier than about 3 Ma. This would make the timing of the uplift and folding approximately synchronous with the deposition of the Bakhtiary conglomerate formation. Reactivation and shortening took place largely in the form of fault-propagation folds (e.g. Suppe and Medwedeff, 1984) above the latest Cretaceous normal faults (Figure 3.4). In some cases the reactivation has extended these faults into the Cenozoic section, and even to the surface (Ponikarov, 1966) (Figures 3.4 and 3.16). The pattern of shortening and reactivation can be demonstrated by the mapping of the pre-compressional top of Cretaceous horizon (Figure 3.15) and is prominently reflected in the current topography (Figure 3.1). Figure 3.4 demonstrates how the larger, bounding faults of the Sinjar deformation are those which experienced most reverse movement. There is no outcrop evidence for any Cenozoic strike-slip having occurred on these east - west faults during the reactivation, although such movement is possible. The easterly trends of structure and topography observed in Syria continue into Iraq. The Iraqi portions of these structures are poorly studied, but the geological and geophysical interpretations of Abdelhady et al. (1983), Naoum et al. (1981) and Hart and Hay (1974), as well as Landsat TM imagery interpretations show that a similar pattern of deformation extends significantly to the east (Figures 1 and 14). Line length balancing through the Syrian Sinjar structure (Figure 3.4) produces overall horizontal shortening estimates of around 1 % (~350 m). Similar work across the Jebel Abd el Aziz (Kent and Hickman, 1997) puts shortening there at less than 1 %. However, it is clear from topographic images (Figure 3.1) and Landsat TM data that the amount of horizontal shortening in the Iraqi portion of the Sinjar structure is significantly higher than this. Cenozoic reactivation and inversion of an older northeast - southwest normal fault (the El Bouab fault) appears to be controlling the southeastern edge of the Abd el Aziz uplift (Figures 3.1, 3.14 and 3.15). Ponikarov (1966) reported ~5 km of left-lateral displacement of Upper Miocene rocks, together with a minor amount of reverse movement on a exposure of this fault, and a repeated section is observed in the nearby El-Bouab well. Ponikarov (1966) also mapped similar structures with smaller amounts of offset in the Jebel Abd el Aziz (Figure 3.14) where they have offset the east-west fault traces. Seismic reflection profiles (Figure 3.13), topography (see arrow on Figure 3.1) and earthquake catalogs (Chaimov et al., 1990; Litak et al., 1997) indicate that the northeast - southwest striking faults mapped from the Palmyride fold and thrust belt towards the northeast have been active recently. However, as discussed by Litak et al. (1997) the sense of motion on these faults is ambiguous. It is possible that they are currently right-lateral and form continuations of dextral faults mapped in the Palmyride fold and thrust belt (e.g. Searle, 1994). Alternatively they could be left-lateral, similar to the El Bouab fault and others in Jebel Abd el Aziz. We now place our findings from northeast Syria into the context of regional tectonics (Figure 3.17a - f). After relatively stable conditions for most of the Early Paleozoic during which Arabia resided on the southern margin of the Tethys ocean, we observe a regional unconformity during the Late Silurian and Devonian. This event is observed contemporaneously in many localities around northern Gondwana and could be interpreted as a consequence of uplift on the flanks of PaleoTethyan rifts, rather than an orogenic event (personal communication, G. Stampfli, 1998). Evidence from many sources points to the initiation of subsidence along the Palmyride / Sinjar trend beginning in the Carboniferous and rifting activity in the Late Permian (e.g. Robertson et al., 1991; Stampfli et al., 1991; Best et al., 1993; Ricou, 1995). The Carboniferous subsidence event is attributed to a reorganization of lithospheric stresses resulting from the docking of the Hun superterrane (Stampfli et al., 1999), or possibly as a result of continued extensional tectonics generated by the opening of the PaleoTethys (Sengor et al., 1988). The more important Late Permian rifting was a result of the formation of the NeoTethys as the Cimmerian superterrane broke away from Gondwana towards the northeast through oceanic accretion, and spreading began in what is now the eastern Mediterranean (Garfunkel, 1998). We support the hypothesis that the Palmyride / Sinjar structure could be an aulacogen (e.g. Ponikarov, 1966; Best et al., 1993), and note that in most respects it fits the definition of an aulacogen as used by Sengor (1995). Sengor (1995) described an aulacogen as the failed arm of a rift-rift-rift triple junction with mainly clastic syn-rift fill covered by carbonate post-rift sediments, repeatedly reactivated with some strike-slip parallel to the rift axis, and possibly formed along a much older zone of weakness. Furthermore, the amount of faulting and deformation in the Palmyride / Sinjar structure diminishes towards the northeast, again similar to the along-strike variation that would be expected in an aulacogen (Figure 3.17a). The plate reconstructions of Ricou (1995) and Stampfli et al. (1999) would allow for rifting in the Palmyrides, as would certain paleogeographic scenarios considered by Robertson et al. (1996). Further evidence for Late Permian and Early Mesozoic rifting in the vicinity of the Palmyride / Sinjar rift is found in Israel farther to the southwest (Guiraud and Bosworth, 1997) where syn-sedimentary thickening and volcanics are described. This activity continued into the Mesozoic related to the formation of the Levantine passive margin there. Limited well data from Lebanon inhibit interpretations from that area although Beydoun (1981) speculated on the occurrence of an Lebanese aulacogen in Late Paleozoic / Mesozoic time. The Late Paleozoic rifting and subsidence activity observed along the Palmyride / Sinjar trend could have been concentrated there along a zone of crustal weakness relic from the Late Proterozoic (Pan-African) accretion of the Arabian platform (e.g. Stoesser and Camp, 1985). It has previously been suggested that the Palmyrides might lie above such a suture or shear zone (e.g. Best et al., 1990) that could form a mobile zone between the relatively stable crustal blocks of the platform, for instance the Aleppo plateau in the north and the Rutbah uplift in the south. 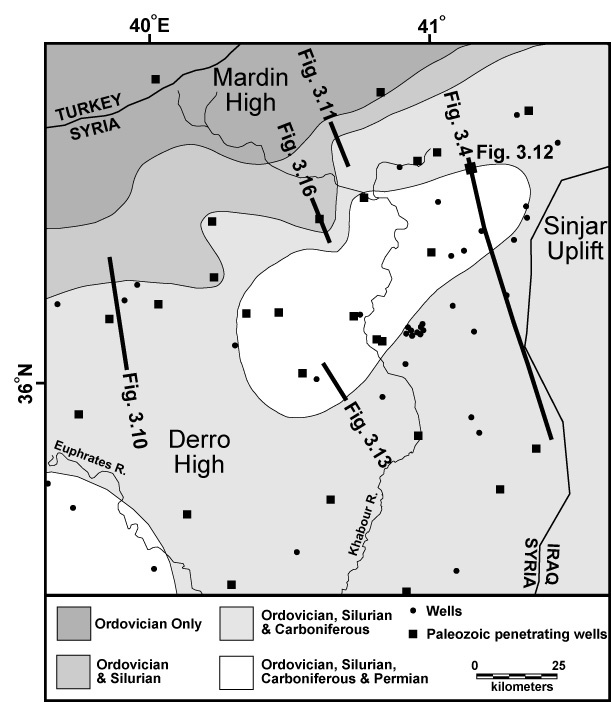 The exception to the pattern of NE-SW rifting in Syria is the Derro high of central Syria (Figure 3.1). As discussed, this area was a structural high in the Early Triassic and possibly the Carboniferous, and represents the 'Beida Arch' of Kent and Hickman (1997) that connects the adjacent Rawda and Mardin highs (Figure 3.1). The work of Brew et al. 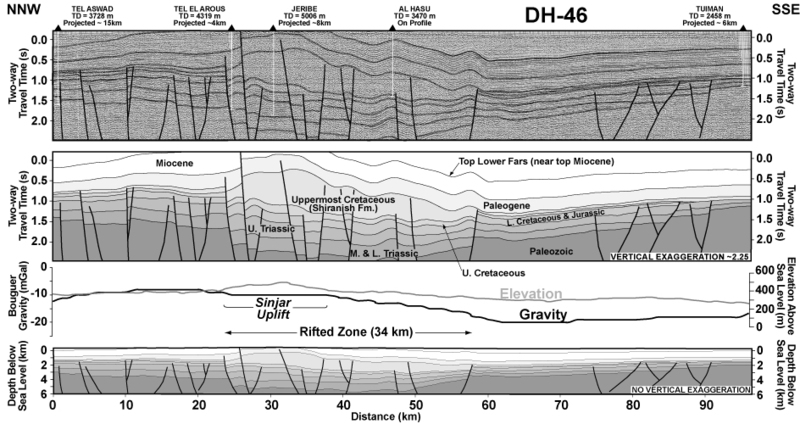 (1997) suggests that the Derro high is a basement uplift, partially bounded by faults, a conclusion supported by the present seismic reflection interpretations and previous work (Sawaf et al., 1993). Thus the uplifting of the Derro high is not part of the structural shortening of the Palmyride fold and thrust belt that began in the Late Cretaceous (e.g. Chaimov et al., 1993). We speculate, admittedly with limited evidence, that this structure could be the interior corner of a old continental block that participated in the accretion of the Arabian platform in the Proterozoic. Such an accretionary pattern, in which suture zones would underlie the Palmyride fold and thrust belt and the Euphrates graben, but not the Sinjar, was suggested by Litak et al. (1997) as a modification of the original suggestion of Best et al. (1993). As a result of such an arrangement, rifting in the present Sinjar region would be less pronounced than in the Palmyrides. This could further explain the relatively limited occurrences of Late Paleozoic faulting in northeast Syria. Widespread erosion around the Permo-Triassic boundary left Permian deposits preserved in only the deepest parts of the Palmyride / Sinjar rift (Figure 3.9). This pattern could be interpreted as a result of post-rift thermal uplift, as well as a consequence of globally low sea levels. It is debated whether rifting on the northern margin of Gondwana continued into the Triassic (Robertson et al., 1991), or if rifting terminated in the Permian and thermal subsidence dominated Triassic tectonics (Stampfli et al., 1991). Although the current data do not allow a complete answer to this, much of the Mesozoic sedimentation in the Palmyride / Sinjar basin is more concordant with thermal subsidence above the rift. During the Triassic, Syria changed from being an east-facing margin, to a westward-facing one (Best et al., 1993) as the Mesogean ocean formed in the west. This is illustrated in the isopach for that time (Figure 3.17b) that shows the further development of the Palmyride / Sinjar basins along the axis of the earlier Paleozoic rift. Clearly the Palmyride basin is connected to the developing margin along the Levantine where most sediment accumulation was occurring. In this respect the Palmyride basin was similar to the Benue trough in Nigeria that formed an embayment on the margin of the opening Atlantic (e.g. Sengor, 1995). Isopachs also show distinct thickening northeast of the Sinjar area in northeast Syria (Figure 3.17b). The Sinjar region was linked to the major Middle Eastern basin in the northeast that was developing along the northern passive margin of Gondwana (Lovelock, 1984). Thus sedimentation there was controlled by this as well as the rifting and subsidence of the Palmyride / Sinjar trend. Some evidence points towards renewed rifting in the Late Triassic (Delaune-Mayere, 1984). This is seen as a slight acceleration in both the subsidence curve shown here (Figure 3.7) and in Sawaf et al. (1999). Undoubtedly, the opening of the NeoTethys was a prolonged and complex event distributed widely in time and space. This complexity is manifest in the geologic history of northeast Syria and the rest of the Arabian platform. The Late Jurassic / Early Cretaceous was the time of a significant regional unconformity throughout the northern Arabian platform. Laws and Wilson (1997) suggested that this regional uplift could be associated with plume activity, as it occurred synchronously with widespread volcanic activity having possible plume-type geochemical signatures. The somewhat accelerated deposition found in the Sinjar area, the Palmyrides (Best, 1991; Chaimov et al., 1992) and the eastern Mediterranean at this time could also be a result of this regional volcanic / tectonic activity. Some researchers have also documented that accelerated spreading in the eastern Mediterranean perhaps contributing to the Late Jurassic / Early Cretaceous faulting (Robertson and Dixon, 1984). During Cretaceous time, a major plate boundary reorganization took place (Figure 3.17c). Sea-floor spreading was dying out and subduction was underway on the northern margin of the NeoTethys ocean as its consumption commenced. Through the dating of volcanics and other work, Dercourt et al. (1986) found evidence for a new northeast-dipping, northwest - southeast striking, intra-oceanic subduction zone in the NeoTethys near the margin of Arabia around the Turonian / Coniacian boundary. In the Euphrates graben major rifting seems to have commenced in the Coniacian (Lovelock, 1984; Litak et al., 1997). We suggest that the extension in Syria at this time was a consequence of stresses originating from slab pull along this subduction zone, as first proposed by Lovelock (1984). Zeyen et al. (1997) calculated that slab pull effects could extend a crust that was already under the influence of a mantle plume for instance, such as that proposed by Laws and Wilson (1997). Additionally, it has been suggested that the crust beneath the axis of the Euphrates fault system was a weak zone inherited from Proterozoic accretion of the Arabian platform (Litak et al., 1997), as discussed above. Thus the northwest - southeast striking subduction zone, together with plume activity and a possible pre-existing weak zone, caused extension in the Euphrates fault system. Stampfli et al. (1999) suggested a similar slab pull mechanism could have created the Syrt (Sirte) basin in Libya. An alternative mechanism for the extension in the Euphrates and Sinjar - Abd el Aziz areas was proposed by Alsdorf et al. (1995). Using the principles of Seng�r (1976), they suggested that the initial latest Cretaceous continental collision along the northern margin of the Arabian plate caused tensional forces orthogonal to the collision, thus creating the Euphrates fault system and Sinjar - Abd el Aziz faulting. However, the earlier initiation of faulting in the Euphrates graben (Litak et al., 1998), the increasing tectonism away from the collision (Litak et al., 1997), and the relatively large distance of the Euphrates from the collision, tend to invalidate this suggestion. For the Sinjar - Abd el Aziz area, the strongly oblique angle and distance from the initial collision, suggests this mechanism is also unlikely to have been the cause of faulting there. Rather, we propose that the initial collision caused the abrupt cessation of extension in the Euphrates and Sinjar - Abd el Aziz areas as detailed below. Beginning in the Late Campanian - Maastrichtian further change took place and pronounced east-west oriented graben formation in the Sinjar - Abd el Aziz area began (Figures 3.8 and 3.17d). This was also the time of most active formation of the east - west trending Anah and Sinjar graben in Iraq (Ibrahim, 1979). We suggest that the formation of east - west trends at this time was a consequence of lithospheric tension created by reorienting subduction off the north and northeast margins of the Arabian peninsula (Dercourt et al., 1986), although the precise orientation and location of this subduction is difficult to ascertain. Additionally, the relative southerly advance of ophilolitic nappes that were to obduct onto the northern margin could have contributed to normal faulting through loading effects (Yilmaz, 1993). These factors could cause roughly north - south stress that resulted in extension, or more likely transtension, within the Sinjar - Abd el Aziz area. Perhaps the strain was accommodated there because it represented a structurally weak zone of thick sedimentation on the northern edge of the Sinjar basin, although the precise reasons for east - west striking fault formation here remains somewhat enigmatic. The Euphrates fault system at this time was experiencing transtension under the influence of the more obliquely oriented, north - south directed, extension direction (Figure 3.17d). In agreement with this, Litak et al. (1997) reported that strike-slip features are more common amongst the northwest - southeast striking faults of the Euphrates deformation, than amongst the west-northwest - east-southeast striking structures. Extension in all areas stopped abruptly very near the end of the Maastrichtian. This is evidenced by the unconformities in the Euphrates graben and Abd el Aziz areas and the absence of faulting in the Tertiary section (e.g. Figure 3.4). Late Maastrichtian folding and basin inversion are widely reported in the southwestern Palmyride fold and thrust belt (e.g. Chaimov et al., 1992; Guiraud and Bosworth, 1997) signaling that the stresses that stopped the rifting in the east of Syria, caused uplift in the west. Latest Maastrichtian time also saw some relatively minor shortening in the foothills of Turkey farther to the north (Cater and Gillcrist, 1994). This transition from an extensional to a contractional regime was perhaps due to collision of the Arabian platform with the intra-oceanic subduction trench in the north and east, as suggested by Lovelock (1984). This event was related to widespread Maastrichtian obduction of supra-subduction ophiolites along the northern and northeastern margin of Arabia (Robertson et al., 1991). This was not the Eurasian - Arabia collision, however, and the NeoTethys ocean, with associated subduction, persisted to the north and east. The Paleogene was largely a time of quiescence in the northern Arabian platform with widespread thermal subsidence following rifting in the Euphrates and Sirhan grabens (Figure 3.17e) and deposition of significant open marine sediments elsewhere. Chaimov et al. (1992) documented minor uplift in the southwest Palmyride fold and thrust belt in Middle Eocene time, and minor shortening is also reported in the Mardin area in southern Turkey for that time (Cater and Gillcrist, 1994). The Late Eocene was important in the development of the Syrian Arc (Guiraud and Bosworth, 1997) and detailed field work by Kent and Hickman (1997) reveals that the Abd el Aziz was perhaps a very subtle structural high during latest Eocene. The mid-late Eocene has been documented as a period of collision in the northwestern corner of Arabia (e.g. Hempton, 1987; Ricou, 1995) with what Dercourt et al. (1986) call the Kirsehir block, thus explaining these observations (Figure 3.17e). Around mid-Miocene time (~15 Ma) (Hempton, 1987; Yilmaz, 1993) terminal suturing occurred between Arabia and Eurasia along the Bitlis and Zagros sutures, bringing with it widespread horizontal shortening throughout the region. This collision caused accelerated basin inversion of the Palmyride fold and thrust belt (Chaimov et al., 1992), minor shortening in the northwest portion of the Euphrates fault system (Litak et al., 1997), and shortening in the Turkish foothills (Cater and Gillcrist, 1994) and the Zagros (Ala, 1982). Kent and Hickman (1997) report signs that the Abd el Aziz may have been a subtle high during the Late Miocene. However, major uplift of the Sinjar - Abd el Aziz only occurred in the mid / late Pliocene - Recent. Interestingly, Pliocene time saw renewed northward movement of Arabia with respect to Eurasia under the influence of renewed spreading in the Red Sea accommodated by escape along the then newly active North and East Anatolian faults (Hempton, 1987). This interpretation is supported by F�raud et al. (1985) who dated dikes and volcanic alignments in Syria, and related them to crustal stress directions. They found that there was a reorientation at around 5 Ma from northwest - southeast maximum compressive stress, to a more north - south direction. This could explain why north - south shortening in the Sinjar - Abd el Aziz area occurred distinctly after northwest - southeast shortening in the Palmyrides. The southeast of the Euphrates fault system has also experienced Pliocene transpression (Litak et al., 1997) that geomorphological evidence suggest might be still active today (Ponikarov, 1966). The Euphrates fault system shows much less shortening than the Sinjar - Abd el Aziz area due to the latter's proximity to the northern margin, and its nearly perpendicular orientation to the maximum horizontal compression, in contrast to the Euphrates fault system's oblique angle (Figure 3.17f). Currently the Palmyride region is deforming by transpression (Chaimov et al., 1990; Searle, 1994), under the influence of stresses from the northwest (Figure 3.17f). Our analysis suggests that the northeast trending faults mapped from the Bishri block towards the Abd el Aziz (Figures 3.1, 3.14 and 3.17f) could be acting to translate right lateral shear away from the Palmyride region. This would imply counterclockwise rotation of the Bishri block. Alternatively, these could be sinistral faults active under the north - south compression, implying that the Bishri block is undergoing clockwise rotation (Best, 1991). Focal mechanisms and surface evidence are not yet sufficient to resolve this issue. Historically, northeast Syria was the most hydrocarbon-productive region in the country, although the Euphrates graben (Figure 3.2) is now volumetrically more prolific (e.g. Litak et al., 1998). Estimated recoverables from Syria are about 2.5 Bbbl of oil and 8.5 TCF of gas (Oil & Gas Journal, December 1998). The northeast fields still form an appreciable part of the country's 550,000 barrels a day of oil production with, for instance, the Tichreen field (see location on Figure 3.2) producing about 10 % of this (GeoArabia, E & P Features, September 1997). The relatively minor Late Mesozoic extension and Late Cenozoic horizontal shortening described in this paper were critical to the plays in northeast Syria, southeast Turkey, and northwest Iraq (e.g. Harput et al., 1992). Hydrocarbons are trapped in fault blocks and fault-propagation folds above reactivated normal faults. These relationships are evident from a cursory comparison between field locations (Figure 3.2) and Figures 3.1 and 3.4. Most source rocks in northeast Syria are thought to be of Cretaceous and Triassic age (Metwalli et al., 1974; Ala and Moss, 1979). Reservoirs are predominately found in Mesozoic and Cenozoic fractured carbonates that were charged during the Late Mesozoic and Late Cenozoic; many fields have multiple objectives in the Miocene, Cretaceous and Triassic (Ala and Moss, 1979). Sealing is accomplished by shales and evaporites that are distributed throughout the Mesozoic and Cenozoic sections. The older reservoirs tend to harbor lighter oils or gas. As an example of current production in northeast Syria, the Tichreen field produces from four horizons: the Chilou (Oligocene), Jaddala (Middle Eocene), Shiranish (Maastrichtian) and Kurrachine (Middle Triassic). All of these formations are carbonates with generally low porosity and fracture permeability. Oils of ~18 API gravity are produced from the upper formations, and gas from the Triassic (Alsharhan and Nairn, 1997). In Syria, producing Cenozoic reservoirs in fault-propagation formed anticlinal traps have been charged since the initiation of Late Cenozoic fault reactivation (Ala and Moss, 1979). However, farther north in Turkey, a greater amount of shortening has led to fault propagation breaching many of the reservoirs (Cater and Gillcrist, 1994). This illustrates the critical relationship between the extent of structural inversion and the formation of viable hydrocarbon traps. The reservoirs in northeast Syria are reminiscent of those in the Zagros where Ala (1982) reported various levels of fractured carbonate reservoirs, with traps formed mainly in anticlines. Migration of the oil into these traps has occurred since the folding events that, as in northeast Syria, are a Late Cenozoic phenomenon. As production has declined in these relatively younger fields more attention has focused on possible Paleozoic plays, as elsewhere within Arabia (Al-Husseini, 1992). Graptolitic Silurian shale source rocks of the Tanf formation (Figure 3.3), have been documented in the Euphrates graben and through most of the Middle East. Additionally, the Lower Ordovician Swab formation seems to form a viable source (Alsharhan and Nairn, 1997). In northeast Syria the Tanf shales exist over much of the area (Figure 3.9) before being eroded out towards Turkey; the Swab is ubiquitous. The top of the Tanf is found between ~1400 mbmsl (meters below mean sea level) and ~2300 mbmsl across much of the study area, but deepens to ~4000 mbmsl in the vicinity of the Khabour river in the south of the study area. The top of the Swab formation is generally found ~500 m or more deeper than the top of the Tanf formation, except on the Mardin high where the Silurian and Upper Ordovician have been lost to erosion (Figure 3.9). 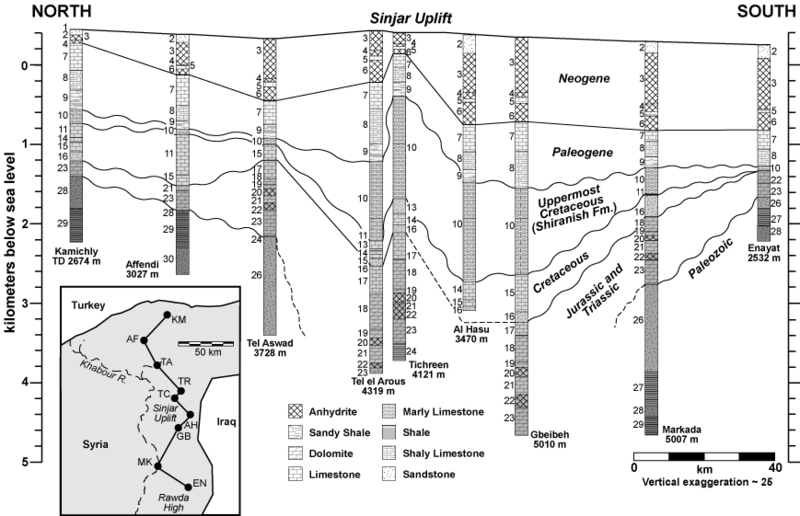 The work of Serryea (1990) suggests that the Silurian and Ordovician age sources in northeast Syria are generally mature. In southeast Turkey, where Silurian oil and gas discoveries have been made, the Silurian Dadas formation is the best source with TOC of 2 - 5 % and favorable maturity (Harput et al., 1992), similar to results from the Tanf formation in north Syria. In Syria reservoir rocks in the Paleozoic could include Permo-Carboniferous and Ordovician sandstones that are present over most of the region (Figure 3.9). The depth to top of the Paleozoic section varies significantly throughout the study area from around sea level on the Derro High to more than 3700 mbmsl in the Sinjar trough. Well data from northeast Syria show Upper Ordovician age Affendi sandstones to have 15-25 % porosity and permeabilities of up to 500 md. 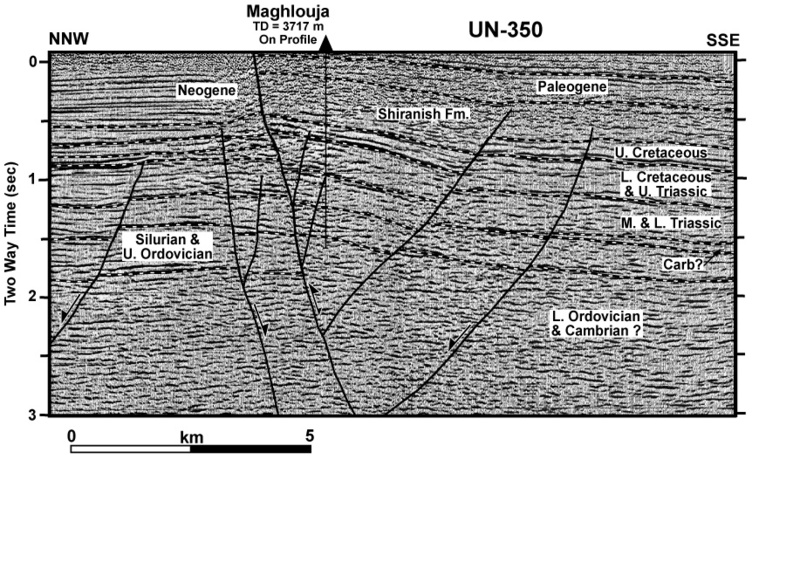 The Maghlouja well on the Abd el Aziz structure (Figures 3.2 and 3.16) found Paleozoic oil and gas in uneconomic qualities (Kent and Hickman, 1997). 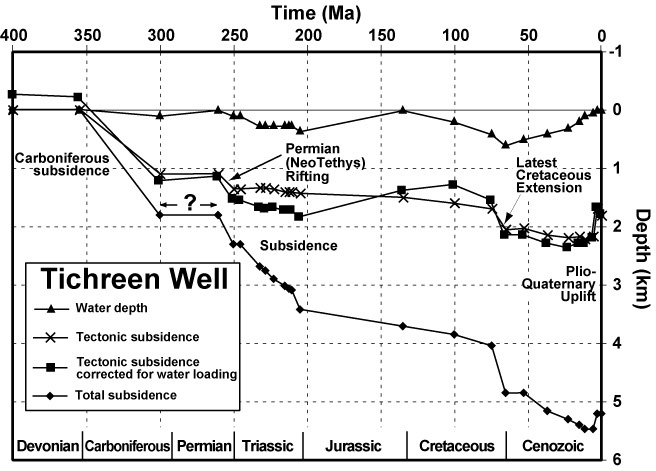 This well had shows of gas in the Silurian section, and limited shows of relatively light oil (39 API gravity) in the Upper Ordovician Affendi formation (K. Norman, personal communication, 1998). Perhaps this oil was sourced in the Silurian and migrated after fault inversion juxtaposed that unit with the Ordovician in the Neogene (Figure 3.16)? This potentially recent migration could be the cause of low charge. For other potential Paleozoic reservoirs, transgressive and regressive cycles that prevailed through much of the Paleozoic could have left viable stratigraphic traps in place, whilst fault control is possible along the axis of the Euphrates faulting west of Abd el Aziz. Timing of migration could be the deciding factor for Paleozoic production in this area. Current exploration in eastern Syria (GeoArabia, E & P Features, September 1997) will reveal more about Paleozoic hydrocarbon potential. The Sinjar area of northeast Syria was part of the larger southwest - northeast trending Palmyride / Sinjar basins from Late Paleozoic to Late Cretaceous time. Although rifting took place in the Palmyrides / Sinjar in the Late Paleozoic, during the Mesozoic most of the stratigraphic thickening was subsidence related. Following plate tectonic reorganization in Cretaceous time, rifting commenced along northwest - southeast trends in the Euphrates fault system beginning in the Coniacian. In later Cretaceous time, extension began across east - west striking faults in the Sinjar - Abd el Aziz area causing substantial thicknesses of syn-extensional Late Campanian - Maastrichtian marly limestone to be deposited there. Latest Cretaceous collisional event along the northern Arabian plate margin terminated the extension in the Sinjar - Abd el Aziz area. Eocene - Miocene suturing of Arabia to Eurasia had little effect on the structures of northeast Syria, despite being the cause of significant uplift in the adjacent Palmyride fold and thrust belt. Rather, the stress reorganization and northward Arabian plate movement experienced since Pliocene time has caused reactivation of the normal faults in a reverse sense in northeast Syria. Fault-propagation folding and structural inversion have resulted in the topography that persists in the area today. This late stage structural reactivation is critical to Cenozoic and Mesozoic anticlinal hydrocarbon trapping in the area. Paleozoic horizons remain to be fully explored. Abdelhady, Y.E., A. Tealeb and F.A. Ghaib 1983. 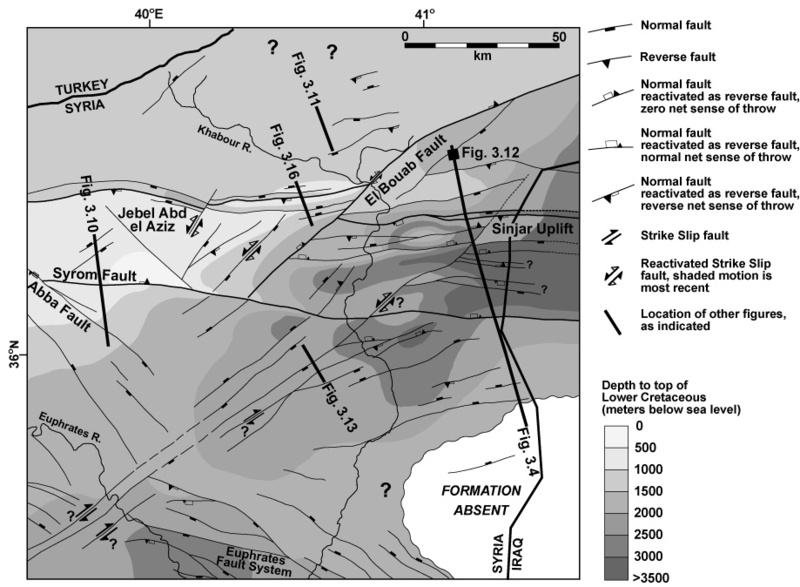 Tectonic Trends Inferred from Gravity Field Analysis in the Sinjar Area, Northwest Iraq. International Basement Tectonics Association, 4, 237-244. Abu-Jaber, N.S., M.M. Kimberley and V.V. Cavaroc 1989. Mesozoic-Palaeogene Basin Development within the Eastern Mediterranean Borderland. Journal of Petroleum Geology, 12, 419-436. Al-Husseini, M.I. 1992. Potential Petroleum Resources of the Paleozoic Rocks of Saudi Arabia. Proceedings of the World Petroleum Congress, Buenos Aires, Argentina, 1991, 13, 3-13. Al-Jumaily, R. and L. Domaci 1976. Geological and Tectonic Position of Jebel Sasan-Jebel Ishkaft Area, NW of Tel Afar, Iraq. Journal of the Geological Society of Iraq, 9, 101-115. Al-Laboun, A. 1988. The Distribution of Carboniferous-Permian Siliclastic Rocks in the Greater Arabian Basin. Geological Society of America Bulletin, 100, 362-373. Al-Naqib, K.M. 1960. Geology of the Southern Area of Kirkuk Liwa, Iraq. Second Arab Petroleum Congress, Beirut, Lebanon, The Secretariat General of the League of Arab States, 1-49. Ala, M.A. 1982. Chronology of Trap Formation and Migration of Hydrocarbons in the Zagros Sector of Southwest Iran. American Association of Petroleum Geologists Bulletin, 66, 1535-1541. Ala, M.A. and B.J. Moss 1979. Comparative Petroleum Geology of Southeast Turkey and Northeast Syria. Journal of Petroleum Geology, 1,. 3-27. Alsdorf, D., M. Barazangi, R. Litak, D. Seber, T. Sawaf and D. Al-Saad 1995. The Intraplate Euphrates Depression - Palmyrides Mountain Belt Junction and Relationship to Arabian Plate Boundary Tectonics. Annali Di Geofisica, 38, 385-397. Alsharhan, A.S. and A.E.M. Nairn 1997. Sedimentary Basins and Petroleum Geology of the Middle East. Elsevier, Amsterdam, 843 p.
Barazangi, M., D. Seber, T. Chaimov, J. Best, R. Litak, D. Al-Saad and T. Sawaf 1993. Tectonic Evolution of the Northern Arabian Plate in Western Syria. In E. Boschi, E. Mantovani and A. Morelli (Eds. 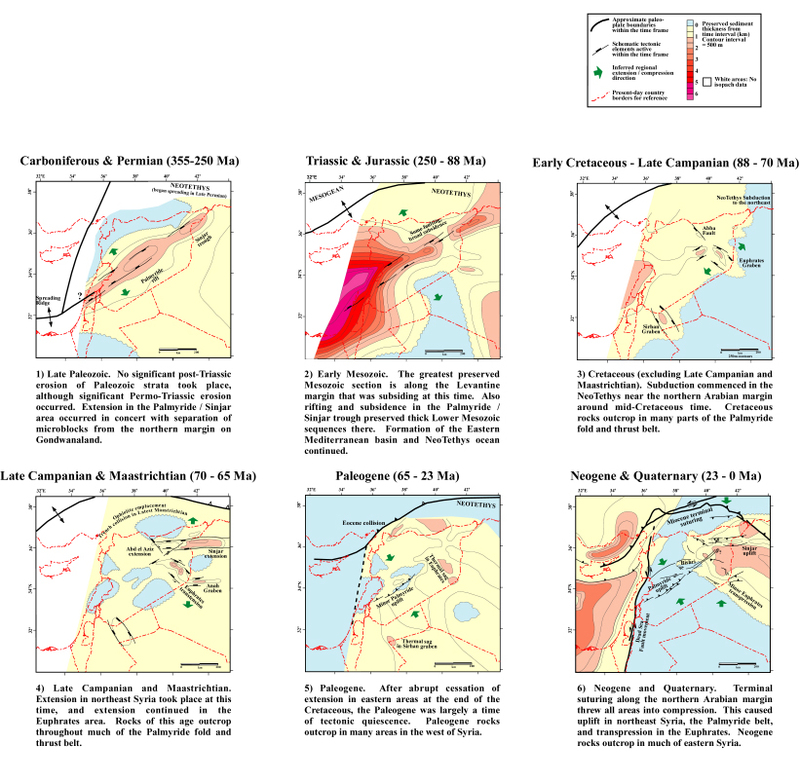 ), Recent Evolution and Seismicity of the Mediterranean Region, Kluwer Academic Publishers, Netherlands, 117-140. BEICIP 1975. Gravity Maps of Syria: Damascus (Syria). Bureau d'etudes industrielles et de cooperation de l'institut francais du petrole, Hauts de Seine, 96 p.
Best, J.A., 1991. Crustal Evolution of the Northern Arabian Platform Beneath the Syrian Arab Republic. Ph.D. Thesis, Cornell University, Ithaca, New York, 152 p.
Best, J.A., M. Barazangi, D. Al-Saad, T. Sawaf and A. Gebran 1990. Bouguer Gravity Trends and Crustal Structure of the Palmyride Mountain Belt and Surrounding Northern Arabian Platform in Syria. Geology, 18, 1235-1239. Best, J.A., M. Barazangi, D. Al-Saad, T. Sawaf and A. Gebran 1993. 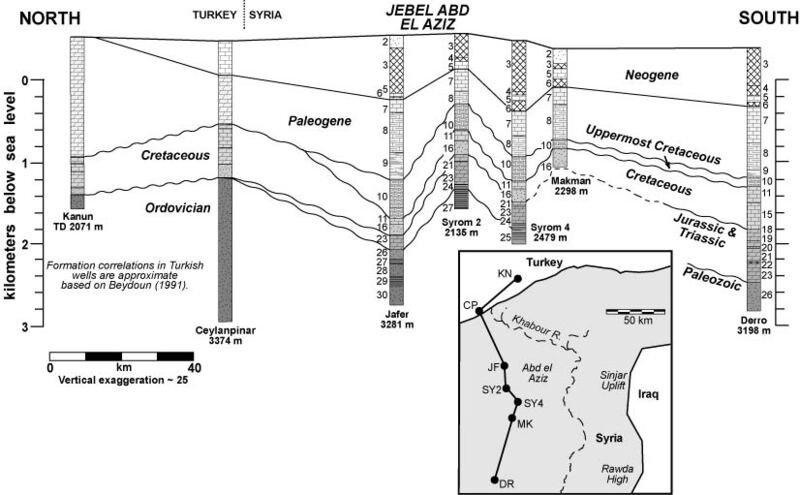 Continental Margin Evolution of the Northern Arabian Platform in Syria. American Association of Petroleum Geologists Bulletin, 77, 173-193. Beydoun, Z. 1981. Some Open Questions Relating to the Petroleum Prospects of Lebanon. Journal of Petroleum Geology, 3, 303-314. Beydoun, Z.R. 1991. Arabian Plate Hydrocarbon Geology and Potential � a Plate Tectonic Approach. Studies in Geology, 33, American Association of Petroleum Geologists, Tulsa, Oklahoma, USA, 77 p.
Brew, G.E., R.K. Litak, D. Seber, M. Barazangi, A. Al-Imam and T. Sawaf 1997. Basement Depth and Sedimentary Velocity Structure in the Northern Arabian Platform, Eastern Syria. Geophysical Journal International, 128, 617-631. Cater, J.M.L. and J.R. Gillcrist 1994. Karstic Reservoirs of the Mid-Cretaceous Mardin Group, SE Turkey: Tectonic and Eustatic Controls on their Genesis, Distribution and Preservation. Journal of Petroleum Geology, 17, 253-278. Chaimov, T., M. Barazangi, D. Al-Saad and T. Sawaf 1993. Seismic Fabric and 3-D Upper Crustal Structure of the Southwestern Intracontinental Palmyride Fold Belt, Syria. American Association of Petroleum Geologists Bulletin, 77, 2032-2047. Chaimov, T., M. Barazangi, D. Al-Saad, T. Sawaf and A. Gebran 1990. Crustal Shortening in the Palmyride Fold Belt, Syria, and Implications for Movement Along the Dead Sea Fault System. Tectonics, 9, 1369-1386. Chaimov, T., M. Barazangi, D. Al-Saad, T. Sawaf and A. Gebran 1992. Mesozoic and Cenozoic Deformation Inferred from Seismic Stratigraphy in the Southwestern Intracontinental Palmyride Fold-Thrust Belt, Syria. Geological Society of America Bulletin, 104, 704-715. Delaune-Mayere, M. 1984. Evolution of a Mesozoic Passive Continental Margin: Ba�r-Bassit (NW Syria). In J.E. Dixon and A.H.F. Robertson (Eds. ), The Geologic Evolution of the Eastern Mediterranean, Blackwell Scientific Publications, Edinburgh, Scotland, 151-159. Dercourt, J., L.P. Zonenshain, L.-E. Ricou, V.G. Kazmin, X. LePichon, A.L. Knipper, C. Grandjacquet, I.M. Sbortshikov, J. Geyssant, C. Lepvrier, D.H. Pechersky, J. Boulin, J.-C. Sibuet, L.A. Savostin, O. Sorokhtin, M. Westphal, M.L. Bazhenov, J.P. Lauer and B. Biju-Duval 1986. Geological Evolution of the Tethys Belt from the Atlantic to the Pamirs Since the Lias. Tectonophysics, 123, 241-315. Feraud, G., G. Giannerini and R. Campredon 1985. Dyke Swarms as Paleostress Indicators in Areas Adjacent to Continental Collision Zones: Examples from the European and Northwest Arabian Plates. Mafic Dyke Swarms, Erindale College, University of Toronto, Ontario, Canada, International Lithosphere Program, 273-278. Garfunkel, Z. 1998. Constrains on the Origin and History of the Eastern Mediterranean Basin. Tectonophysics, 298, 5-35. Guiraud, R. 1998. Mesozoic Rifting and Basin Inversion Along the Northern African Tethyan Margin: An Overview. In D.S. Macgregor, R.T.J. Moody and D.D. Clark-Lowes (Eds. ), Petroleum Geology of North Africa, Geological Society of London, Special Publication 132, 217-229. Guiraud, R. and W. Bosworth 1997. Senonian Basin Inversion and Rejuvenation of Rifting in Africa and Arabia: Synthesis and Implications to Plate-Scale Tectonics. Tectonophysics, 282, 39-82. Harput, O.B., F. Goodarzi and O. Erturk 1992. Thermal Maturation and Source Rock Potential of Sedimentary Succession in Southeast Anatolia, Turkey. Energy Sources,. 14, 317-329. Hart, E. and J.T.C. Hay 1974. Structure of the Ain Zalah Field, Northern Iraq. American Association of Petroleum Geologists Bulletin, 58, 973-981. Hempton, M. 1987. Constraints on Arabian Plate Motion and Extensional History of the Red Sea. Tectonics, 6, 687-705. Ibrahim, M.W. 1979. Shifting Depositional Axes of Iraq: An Outline of Geosynclinal History. Journal of Petroleum Geology, 2, 181-197. Kent, W.N. and R.G. Hickman 1997. Structural Development of Jebel Abd Al Aziz, Northeast Syria. GeoArabia, 2, 307-330. Laws, E.D. and M. Wilson 1997. Tectonics and Magmatism Associated with the Mesozoic Passive Continental Margin Development in the Middle East. Journal of the Geological Society, 154, 459-464. Leonov, Y.G., K. Makarem and T. Zaza 1986. Olistostrome Origin for Rocks in the Core of the Abd El Aziz Anticline, Syria. Geotectonics, 20, 142-146. Litak, R.K., M. Barazangi, W. Beauchamp, D. Seber, G. Brew, T. Sawaf and W. Al-Youssef 1997. Mesozoic-Cenozoic Evolution of the Intraplate Euphrates Fault System, Syria: Implications for Regional Tectonics. Journal of the Geological Society, 154, 653-666. Litak, R.K., M. Barazangi, G. Brew, T. Sawaf, A. Al-Imam and W. Al-Youssef 1998. Structure and Evolution of the Petroliferous Euphrates Graben System, Southeast Syria. American Association of Petroleum Geologists Bulletin, 82, 1173-1190. Lovelock, P.E.R. 1984. A Review of the Tectonics of the Northern Middle East Region. Geological Magazine, 121, 577-587. May, P.R. 1991. 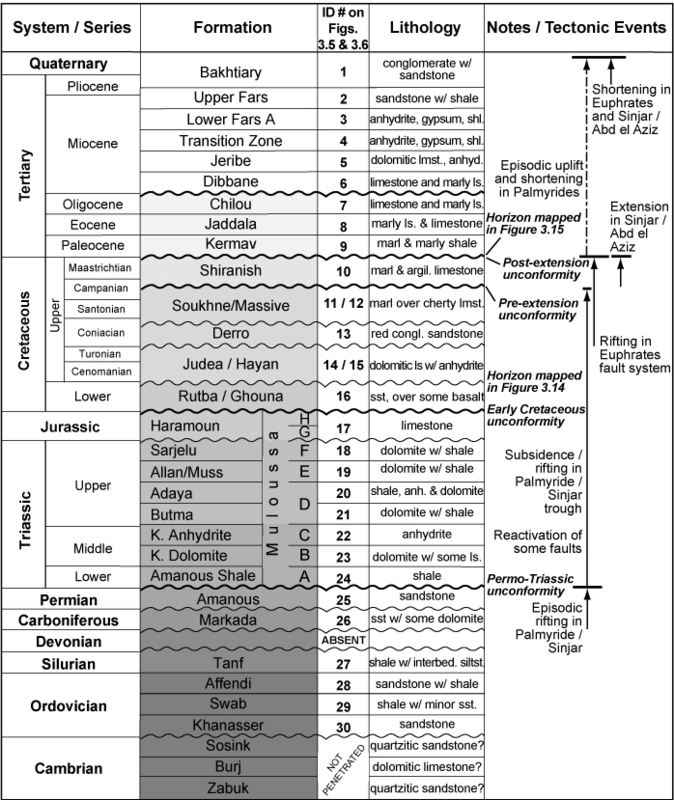 The Eastern Mediterranean Mesozoic Basin: Evolution and Oil Habitat. American Association of Petroleum Geologists Bulletin, 75, 1215-1232. Metwalli, M., G. Philip and M. Moussly 1974. Petroleum-Bearing Formations in Northeastern Syria and Northern Iraq. American Association of Petroleum Geologists Bulletin, 58, 1781-1796. Naoum, A.A., M.S. Atiya and M.R. Al-Ubaidi 1981. Mesoscopic Structures Associated with Sinjar Anticline. Journal of the Geological Society of Iraq, 14, 71-80. Ponikarov, V.P. 1966. The Geology of Syria. Explanatory Notes on the Geological Map of Syria, Scale 1:200 000. Ministry of Industry, Damascus, Syrian Arab Republic. Ricou, L.E. 1995. The Plate Tectonic History of the Past Tethys Ocean. In A.E.M. Nairn, L.-E. Ricou, B. Vrielynck and J. Dercourt (Eds. ), The Ocean Basins and Margins: The Tethys Ocean, Plenum Press, New York, 3-70. Rigo de Righi, M. and A. Cortesini 1964. 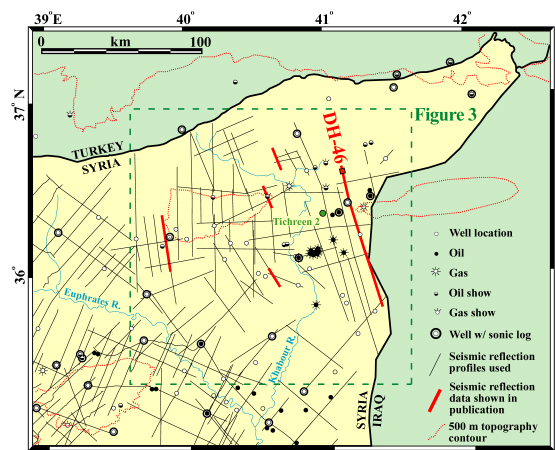 Gravity Tectonics in Foothills Structure Belt of Southeast Turkey. American Association of Petroleum Geologists Bulletin, 48, 1911-1937. Robertson, A.H.F., P.D. Clift, P.J. Degnan and G. Jones 1991. Palaeogeographic and Palaeotectonic Evolution of the Eastern Mediterranean Neotethys. Palaeogeography, Palaeoclimatology, Palaeoecology, 87, 289-343. Robertson, A.H.F. and J.E. Dixon 1984. Aspects of the Geological Evolution of the Eastern Mediterranean. In J.E. Dixon and A.H.F. Robertson (Eds. ), The Geologic Evolution of the Eastern Mediterranean, Blackwell Scientific Publications, Edinburgh, Scotland, 1-74. Robertson, A.H.F., J.E. Dixon, S. Brown, A. Collins, A. Morris, E. Pickett, I. Sharp and T. Ustaomer 1996. Alternative Tectonic Models for the Late Paleozoic-Early Tertiary Development of the Tethys in the Eastern Mediterranean Region. In A. Morris and D.H. Tarling (Eds. ), Paleomagnetism and Tectonics of the Mediterranean Region, Geological Society of London Special Publication 105, 239-263. Sage, L. and J. Letouzey 1990. Convergence of the African and Eurasian plate in the Eastern Mediterranean. In J. Letouzey (Ed. ), Petroleum and Tectonics in Mobile Belts; proceedings of the IFP exploration and production research conference, Editions Technip, Paris, 49-68. Sawaf, T., D. Al-Saad, A. Gebran, M. Barazangi, J.A. Best and T. Chaimov 1993. Structure and Stratigraphy of Eastern Syria Across the Euphrates Depression. Tectonophysics, 220, 267-281. Sawaf, T., G.E. Brew, R.K. Litak and M. Barazangi 2000. Geologic Evolution of the Intraplate Palmyride Basin and Euphrates Fault System, Syria (in press). In W. Cavazza, A. Robertson and P. Ziegler (Eds. ), Peritethyan Rift / Wrench Basins and Margins, PeriTethys Memoir #6, Museum National d'Historie Naturelle, Paris. Sclater, J.G. and P.A.F. Christie 1980. Continental Stretching: An Explanation of the Post-Mid-Cretaceous Subsidence of the Central North Sea Basin. Journal of Geophysical Research, 85, 3711-3739. Searle, M.P. 1994. Structure of the Intraplate Eastern Palmyride Fold Belt, Syria. Geological Society of America Bulletin, 106, 1332-1350. Seng�r, A. 1976. Collision of Irregular Continental Margins: Implications for Foreland Deformation of Alpine-Type Orogens. Geology, 4, 779-782. Sengor, A.M.C. 1995. Sedimentation and Tectonics of Fossil Rifts. In C.J. Busby and R.V. Ingersoll (Eds. ), Tectonics of Sedimentary Basins, Blackwell Science, Cambridge, 53-117. Sengor, A.M.C., D. Altmer, A. Cin, T. Ustaomer and K.J. Hs� 1988. Origin and Assembly of the Tethyside Orogenic Collage at the Expense of Gondwana Land. In M.G. Audley-Charles and A. Hallam (Eds. ), Gondwana and Tethys, Geological Society London Special Publication, 119-181. Serryea, O.A. 1990. Geochemistry of Organic Matter and Oil as an Effective Tool for Hydrocarbon Exploration in Syria. Oil and Arab Cooperation, 16, 31-74. Stampfli, G., J. Marcoux and A. Baud 1991. Tethyan Margins in Space and Time. Palaeogeography, Palaeoclimatology, Palaeoecology, 87, 373-410. Stampfli, G.M., J. Mosar, P. Favre, A. Pillevuit and J.-C. Vannay 2000. Permo-Triassic Evolution of the Western Tethyan Realm: The NeoTethys / East Mediterranean Basin Connection (in press). In W. Cavazza, A.H.F. Robertson and P. Ziegler (Eds. ), Peritethyan Rift / Wrench Basins and Margins, PeriTethys Memoir #6, Museum National d'Historie Naturelle, Paris. Stoesser, D.B. and V.E. Camp 1985. Pan-African Microplate Accretion of the Arabian Shield. Geological Society of America Bulletin, 96, 817-826. Suppe, J. and D.A. Medwedeff 1984. Fault-Propagation Folding. Geological Society of America Abstract Program, 16, 670. Yilmaz, Y. 1993. New Evidence and Model on the Evolution of the Southeast Anatolian Orogen. Geological Society of America Bulletin, 105, 251-271. Zeyen, H., F. Volker, V. Wehrle, K. Fuchs, S.V. Sobolev and R. Altherr 1997. Styles of Continental Rifting: Crust-Mantle Detachment and Mantle Plumes. Tectonophysics, 278, 329-352. Figure 3.1: A topographic image of northeast Syria. Reds represent high topography, blues are lows � color scale is non-linear; maximum elevation is ~1460 m on the top of the Sinjar Uplift and minimum is ~150 m near the Euphrates river in the south of the image. Note the Palmyride fold and thrust belt that extends significantly to the southwest, and the Euphrates River valley, that lies roughly above the Euphrates fault system. Arrow highlights surface expression of faulting discussed in text. 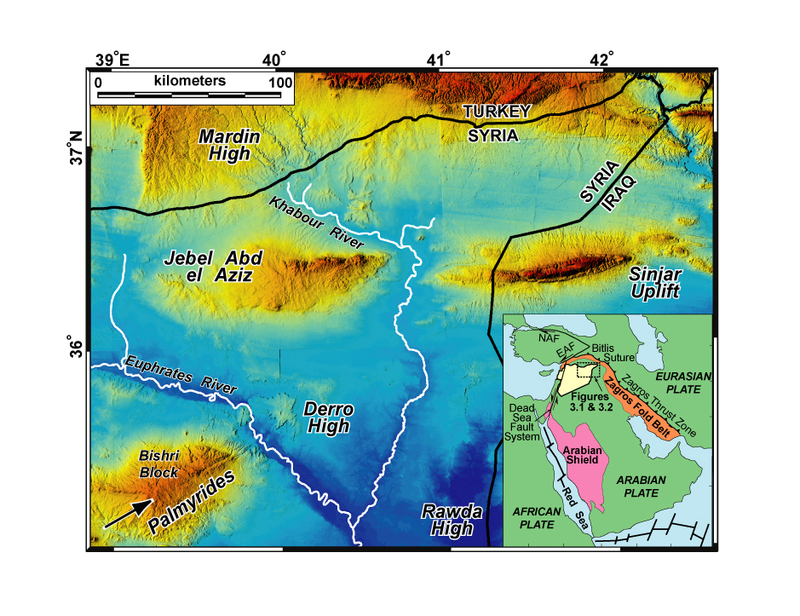 Inset figure shows location of Syria and the surrounding northern Arabian platform in plate tectonic context. Dashed box shows location of main figure. NAF = North Anatolian Fault; EAF = East Anatolian Fault. Figure 3.2: Database map showing locations of selected data sources used in this study. Hydrocarbon status of wells is indicated based on various sources referred to in the text. Abandoned and suspended wells not distinguished. Dashed box (approx. 175 km x 175 km) marks primary study area. The Tichreen 2 well marked in green is location of backstripping analysis (Figure 3.7). Figure 3.3: Generalized stratigraphic column of northeast Syria. Turkish and Iraqi formations use different nomenclature and are not listed - see Beydoun (1991). Note alternative nomenclature for Early Mesozoic formations. Unconformities marked as wavy lines with the most significant interfaces highlighted in bold. Figure 3.4: Depth converted seismic interpretation along seismic profile DH-46. See Figure 3.2 for location. As with all seismic profiling, fault interpretation at depth is somewhat speculative due to degradation of signal with increasing depth. Also, the data do not allow an accurate differentiation of Paleozoic formations along this line. Total depths (TD) in this, and all subsequent figures, are in meters below kelly bushing, and the distances that the wells were projected onto the seismic lines are indicated. Figure 3.5: Well correlation section across the western portion of the Sinjar structure in Syria. See inset for location. Major stratigraphic boundaries, unconformities and formation numbers are shown with reference to Figure 3.3. 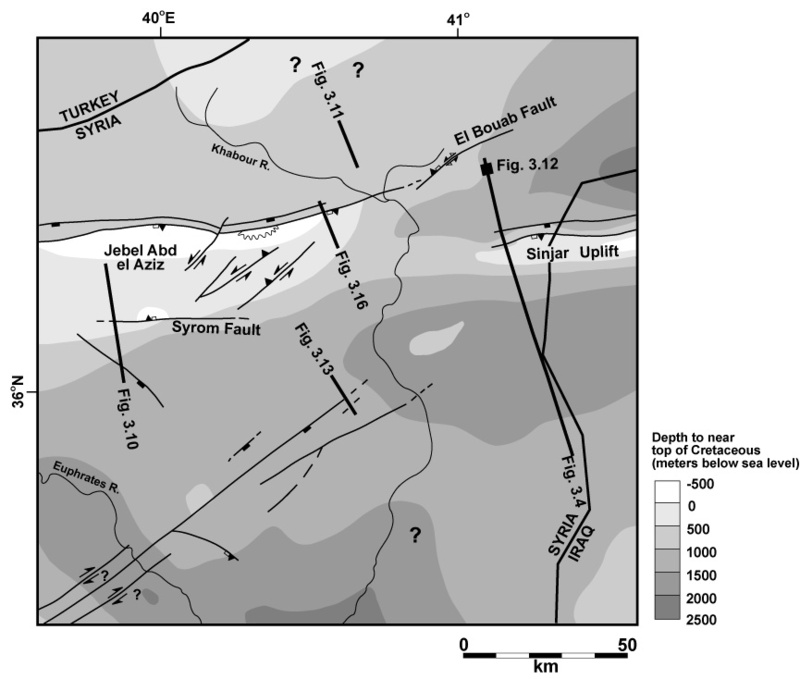 Figure 3.6: Well correlation section across the Abd el Aziz structure in northeast Syria. See inset for location. Major stratigraphic boundaries, unconformities and formation numbers are shown with reference to Figure 3.3. Lithology key is the same as in Figure 3.5. Figure 3.7: Subsidence curves constructed from analysis of current formation thicknesses in the Tichreen 2 well in the Sinjar area (see Figure 3.2 for location). Total subsidence, corrected for compaction, is shown. Also shown are curves corrected for sediment loading effects, and water loading. The assumed paleobathymetry is poorly constrained. Figure 3.8: Schematic block diagrams showing the geologic evolution of northeast Syria since the Late Paleozoic. See Figure 3.2 for location. Figure 3.9: Map showing generalized distribution of Ordovician and younger Paleozoic formations in the study area based on well and seismic data. See Figure 3.2 for location. Figure 3.10: Migrated seismic section AB-06. See Figure 3.2 for location. Major faults are shown. Note the distinct thickening of the Carboniferous unit towards the south-southeast. 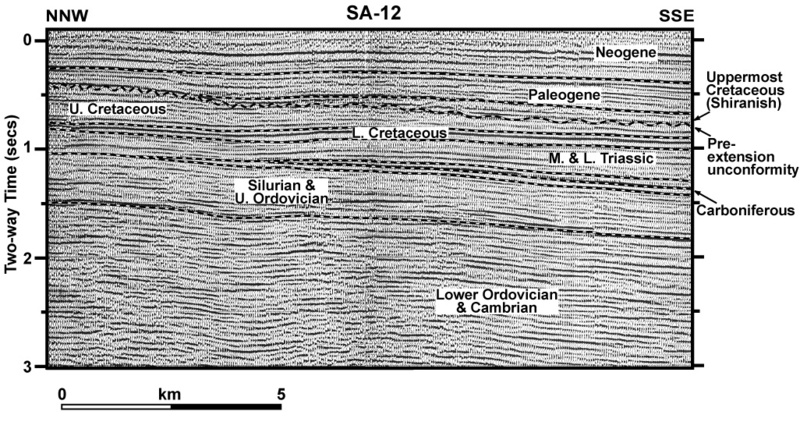 Figure 3.11: Portion of seismic line SA-12. See Figure 3.2 for location. The seismic interpretation is tied to the nearby Affendi and South Al Bid wells. Figure 3.12: Enlarged portion of migrated seismic line DH-46 (Figure 3.4) showing an example of Early Mesozoic and Paleozoic fault controlled thickening in the study area. See Figure 3.2 for location. Figure 3.13: Composite of migrated seismic lines TSY-88-201 and TSY-90-201X with interpretation that is tied to nearby wells. See Figure 3.2 for location. Figure 3.14: Smoothed structure map near top of the Lower Cretaceous Rutbah formation (see Figure 3.3 for stratigraphy and Figure 3.2 for location). Major faults are shown with sense of movement indicators. The most significant faults are shown as bolder lines. Note that the history of movement on many of these faults is complex, and the symbols are only a generalized account of the movement. Some faults of indeterminate displacement are not symbolized. Note the three structural trends: Northeast - southwest predominately along the Palmyride / Sinjar trend; northwest-southeast along the Euphrates fault system; and east - west in the Sinjar - Abd el Aziz area. Figure 3.15: Smoothed structure map near top of Cretaceous (see Figure 3.2 for location). Cretaceous rock outcrop marked with wavy line. Symbols same as Figure 3.14. Note that the top of Cretaceous surface closely follows the topography (Figure 3.1) indicating the lack of any significant Cenozoic sag basin above the Sinjar region. Figure 3.16: Seismic reflection profile UN-350. See Figure 3.2 for location. Major faults are shown with stratigraphic picks tied to Maghlouja and other nearby wells. 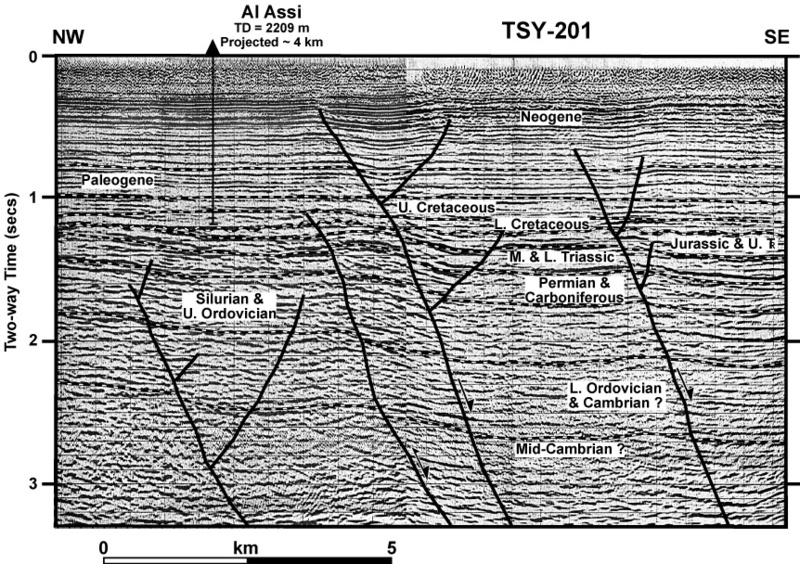 Figure 3.17: Summary maps of the geologic evolution of the northern Arabian platform showing preserved sediment thickness and schematic tectonic events. The isopachs are based on our data plus Al-Naqib (1960); Rigo de Righi and Cortesini (1964); Al-Jumaily and Domaci (1976); Al-Laboun (1988); Abd-Jaber et al. (1989); Sage and Letouzey (1990); May (1991) and Litak et al. (1997). 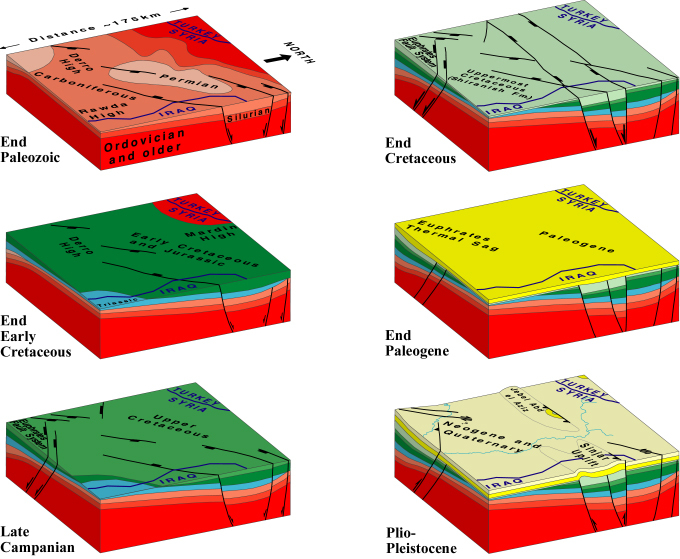 Paleo-plate boundaries are based on Robertson and Dixon (1984), Dercourt et al. (1986), Guiraud (1998) and Stampfli et al. (1999). Each frame illustrates the end of the stated time interval. a) Late Paleozoic (Carboniferous and Permian). The almost ubiquitous cover of Triassic formations indicates that the sediment thicknesses shown here have not been subjected to post-Early Triassic erosion, although significant Permo-Triassic erosion took place. Opening of the NeoTethys ocean along the northeast margin of the Arabian plate was concurrent with rifting along the Palmyride / Sinjar trend. b) Early Mesozoic (Triassic and Jurassic). The greatest preserved Mesozoic section is along the Levantine margin and in the deepest parts of the Palmyride / Sinjar basins that were thermally subsiding with some fault reactivation at this time. c) Cretaceous (Late Campanian - Maastrichtian excluded). Cretaceous rocks outcrop in many parts of the Palmyride fold and thrust belt. Subduction in the NeoTethys caused new extensional events in eastern Syria. d) Late Campanian and Maastrichtian. Cretaceous rocks outcrop in many parts of the Palmyride fold and thrust belt. Extension in northeast Syria took place. e) Paleocene. Paleogene or older rocks outcrop in most areas west and south of the Euphrates river. After abrupt cessation of extension throughout the northern Arabian platform at the end of Cretaceous, the Paleogene was largely quiescent. f) Neogene and Quaternary. Neogene or older rocks outcrop throughout almost the entire study area. Note the thinning over the uplifted areas in the northeast formed largely since the Pliocene as a result of collision along the northern margin.